Go to AutoSport Catalog, online at AutoSportCatalog.com, for all your automotive accessory needs. AutoSport Catalog offers outfitting and gadgets for automobiles, including car covers, seat covers, floor mats and liners, cargo carriers, chargers and jumpers, navigation devices, tire gauges and inflators, safety and security products, and many more gadgets to make driving and car care easier and more comfortable. 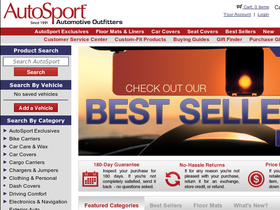 AutoSportCatalog.com offers trusted brands like Covercraft, WeatherTech, Thule, Yakima, and more. But before you check out the wide selection of automotive accessories, be sure to get the latest AutoSportCatalog.com discounts, AutoSport Catalog promotions, and AutoSport Catalog coupon codes, found here at RetailSteal.com. AutoSport Catalog offers shipping in the US and Canada. Save 25% on your entire order of $200 or more from AutoSport Catalog when you use this coupon code. Head over to AutoSport Catalog today and use our coupon code to save 20% on orders of $150 or more. Click the link to start shopping now. Enjoy free standard shipping on your purchase from AutoSport Catalog. Shop now and use coupon code to save. Save 15% on your order from AutoSport Catalog. Use coupon code with purchases $100+. Save 10% on any order from AutoSport Catalog. Use this coupon code to save. Enjoy a $20 discount on your order from AutoSport Catalog when you use this coupon code online. Use code on orders of $100+ to save. Head over to AutoSport Catalog online today and enter our coupon code at checkout to receive a 15% discount on Covercraft gear. Save up to 80% in the AutoSport Catalog outlet. Click here to save on car and driving accessories. Save over 50% on hot deals going on now at AutoSport Catalog. Click here to save big on car gadgets and accessories. Sign up for emails specials at AutoSportCatalog.com and save 10% on your order. Click link to find out more. Keep your hands on the road with cell phone accessories for your automobile. Prices start as low as $1 at AutosportCatalog.com. Click here to shop. Find car covers custom fit for your car, starting as low as $60 from AutoSportCatalog.com. Click here to get started.